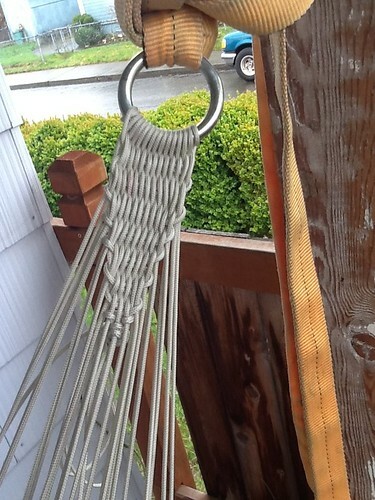 1. make a new porch hammock using the naval rope ends. 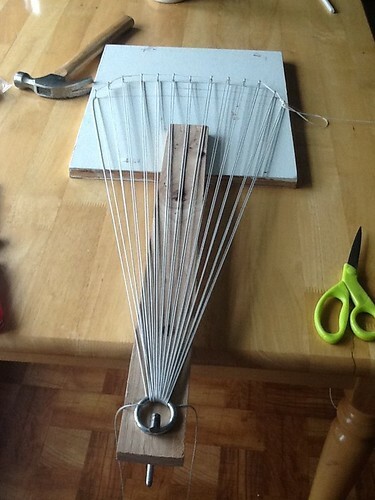 2. prototype for seeing how short I can make a hammock that feels like a 11' foot hammock with mini-spreader bars. This particular hammock is 9'' something. I like the mini-bars, all my diy hammocks will either be mini-bars or rope ends from now on, but they don't pack down as well. The next plan is to get some ripstop and repurpose these nettles for it. the end channels have 3 inch button holes, folded in half, along the edge of the channel. Running through the channel is a 1/8th piece of amsteel. 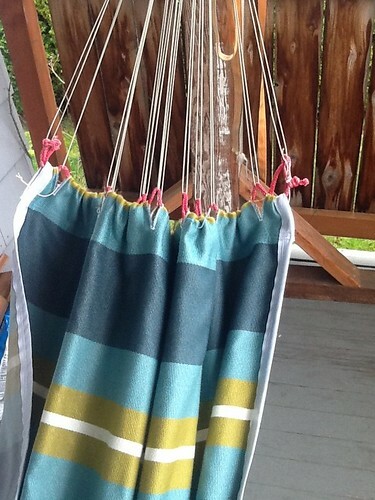 The nettles run around the amsteel making the hammock body removable for cleaning. I used a product called, "The Handy Hundred," and its rated at a 100 pounds and comes in spools of a 100 feet. Its the size of zing-it but only costs 2 dollars at a great military surplus (Andy and Bax) store here in Portland, Oregon. While it holds a lower amount of weight than some would feel safe with, I don't expect it to fail since there is 13 nettles on each side, making a total of 26 strands for each side holding my weight. I'm fairly sure this rope will be adequate. Time will tell. As you can see each side of the nettle has two shorter nettles, but after laying it the hammock I don't think they are necessary. Next time I will leave all the nettles the same length. The length of the nettles was determined by diving the hammock body width in half. In this case, they are 26 inches, with the two side nettles begin 24' and 25'. Not only do I want to make a very comfortable short hammock, but I also want to play around with how the nettles can change how the hammock hangs. In a previous post ( https://www.hammockforums.net/forum/...ad.php?t=88356 ) I shared a picture of an offset clew with the hope that it would work like a footbox. Since the "Handy Hundred" is inexpensive I can easily try new things without breaking the bank. I won't be doing this any time soon, my next project is the perfect pair of underwear, but will post once I do. I encourage everyone to try making a naval hammock. The clews are easy to make, don't tangle easily, provide amazing comfort, and look classy to boot! Dang that looks really good! Nice work. WV has some crazy hybrid hammock with lots of strings on the ends like that except that they are whoopies, where each whoopie starts at the hammock goes threw the clew and back to the hammock. 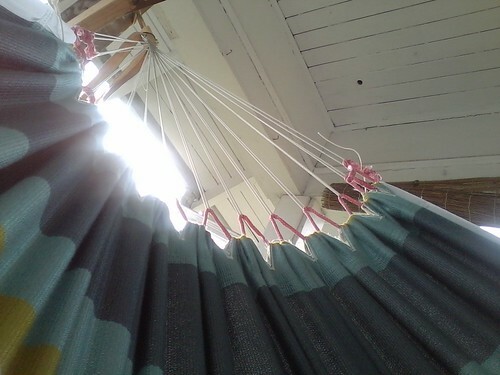 So that every two attach points on the hammock is one whoopie, it that makes sense. I tell you this because this may be an easy way to try different adjustments. Anyway keep up the good work and thanks for sharing. Redoleary- Thanks! I am very impressed with the hammocks by WV and I am impressed that he will dedicate himself to making so many whoopies. I'm not sure the Handy Hundred is a hollow braid rope, but if it is I'll give it a try. One thing I like about the naval clew is that the way you weave the ends through the various nettles really helps them not to become tangled easily. 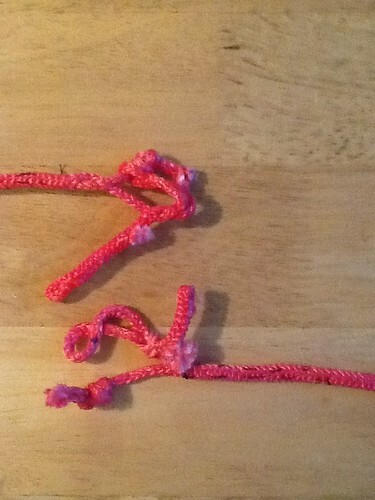 If I made whoopee slings I would have to figure out how to keep them getting tangled.
. 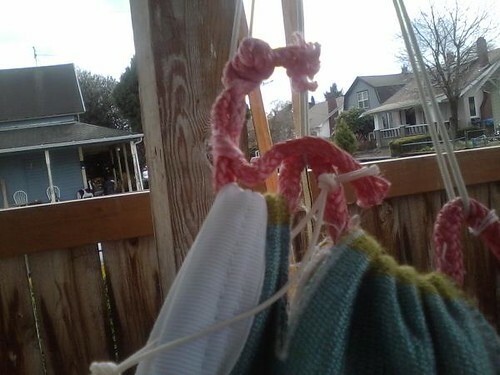 If I made whoopee slings I would have to figure out how to keep them getting tangled. Believe it or not the solution to minimize entanglement is to put fabric under them . WV has sewn some panels under the whoopies that he uses as a sort of shelf but they attenuate the tangling as well. So unfortunately the solution is the very thing you're trying to get away from. Believe it or not the solution to minimize entanglement is to put fabric under them...So unfortunately the solution is the very thing you're trying to get away from. When I was on the porcelain thinking throne tonight I did consider that very option, but between the nettles. It wouldn't double as a pocket, but at least it would ease the mind that cords wouldn't tangle. I am also toying around with the idea of weaving a few strands of cord in various spots to help the cords from going to far from home and getting mixed up with the wrong crowed. I also decided to create, what I am affectionately referring to as "stubbies," smaller clews. From the ring to the hammock body there will be 10 inches. The head end will have the ring centered. The foot end will have the ring offset over the 2nd button hole from the side, so 7 inches from the side. In this set up each nettle will be a different length, thankfully google sketch-up helped me get the exact measurements. I have no idea how it will turn out, but I won't know until I try! 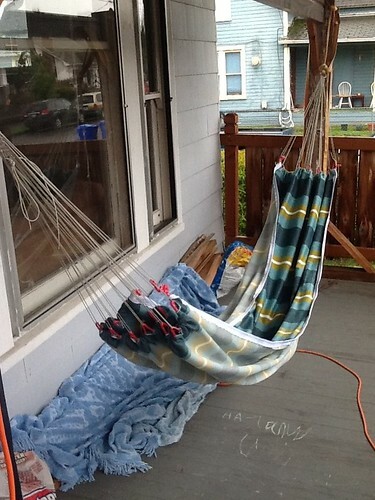 I am 5'10'' and want to make 7' hammock and, if they work, use the stubbies with it. 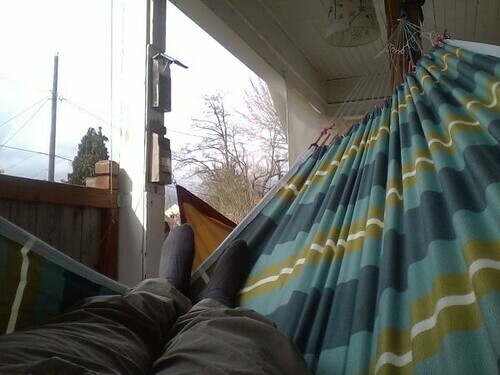 That would be a 8' 8'' hammock. Small could be the new camo! Good work, I don't get the clew thing for people concerned with tangles, I used lashit dogbones on a project. Simply remove biner or other widget or method connecting the loops and untangle if necessary. I didn't believe Sunday School. 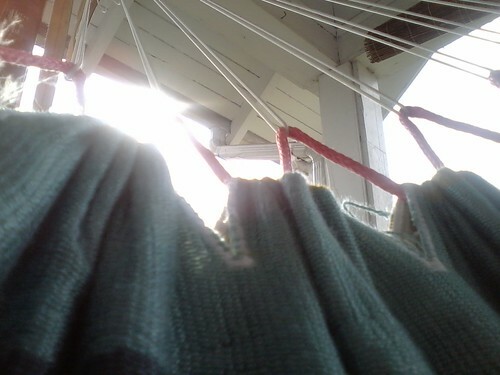 Here are some additional photos of the hammock in action and a few closer detail shots. 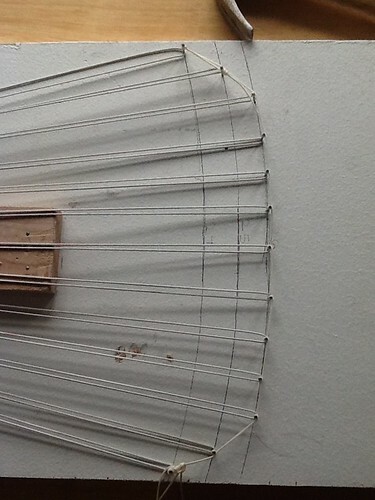 For those who are worried about tangling of lines I suspect that if one piece of no-see-um netting is placed between the top and bottom lines for each nettle, that runs the span of the hammock body or at least the width of the clew when under tension, would stop tangling from happening. I think more people should be exploring how clews can be improved and can make our hammocks better. Another innovative idea, rediscovered from a long time a ago. I'm going to be updating my exploration with clews on my other post, "Making Clews, their jigs, and making a camping hammock." I have updated it with a failed attempt at a differential length clew and insights I gathered from it. Re-Threading gathered ends on ENO hammock? attaching rope to gathered end hammock question?